Lake Arrowhead, California Mountains are an unincorporated community and a census-designated place (CDP) in the San Bernardino Mountains of San Bernardino County, California, within the San Bernardino National Forest, surrounding the Lake Arrowhead Reservoir. The population of the CDP was 12,424 at the 2010 census, up from 8,934 at the 2000 census. It was formerly called “Little Bear Lake,” until around 1920, when a group from Los Angeles, the Arrowhead Lake Company, bought the lake and the land surrounding it, and changed its name to Arrowhead Lake. Tourism is the primary economic generator for the area, contributing several million dollars per year to the county and providing 600 full-time and 700 part-time jobs for local residents. The area is host to over 4 million visitors a year. There are 400 guestrooms in hotels, motels and bed and breakfasts as well as 500 cabins and condos, which are rented on a short-term basis. The city is home to the Arrowhead Country Club and Golf Course. The area is also popular for business conferences. Introducing local camp grounds in the Lake Arrowhead area. This campground is located 20 miles Northeast of San Bernardino, CA in the San Bernardino National Forest. The campground was completely remodeled in 2004, including modern restrooms, showers, & several electric hook-ups for RV’s. The Camp is only 15 minutes away from Lake Gregory, with boating, fishing and a water slide park. 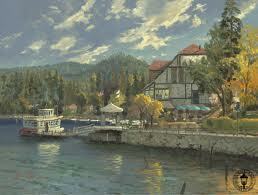 Lake Arrowhead village, with its fine dinning and quaint shops is only 5 minutes away. This campground is located 23 miles Northeast of San Bernardino in the San Bernardino National Forrest, 3 miles from Lake Arrowhead Village, Campground has modern restrooms and running water. For groups of thirty to ninety people, group campgrounds provide another option. Picnic tables, fire rings, and bathrooms – and a certain distance from other campers – make the group campgrounds a popular option for church group and scout camp-outs. There are three group camps located within close proximity of the Lake Arrowhead Communities; Shady Cove, Tent Peg, and Fisherman’s Camp. Reservations are required. Learn more about the exciting recreations activities Lake Arrowhead has to offer. All properties located within the boundaries of Arrowhead Woods have lake rights. This means the owners have the right to use the Lake for Recreational Purposes i.e., swimming, fishing, and boating. However Visitors of the area can access the Lake via Boat Tour by the Arrowhead Queen or water Skiing with McKenzie Ski School. 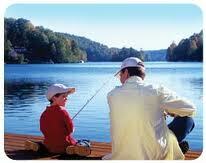 Only Arrowhead Woods property owners, their families, and guests are permitted to fish in Lake Arrowhead. Proof may include ALA boat sticker, ALA membership card, or copy of grant deed. A current California State fishing license is also required. There is a wide variety of hiking trails available to Lake Arrowhead Visitors. To find the trail that best fits you and your ability Contact the Local Ranger station to find out up to date trail conditions, if there are any fire restrictions or if you require any permits. Another Fantastic way to take in the impressive Lake Arrowhead scenery is by Off-Road Vehicle trails such as, Pilot Rock Trail, Dishpan Springs trail, Willow Creek/Pinnacles, and Devils hole. The US Forest Service asks you to “know before you go.” Visit The San Bernardino National forest U.S. Forest Service web site for Current Fire restrictions and guidelines. There is a wide variety of hiking & mountain bike trails available to Lake Arrowhead Visitors. To find the trail that best fits you and your ability Contact the Local Ranger station to find out up to date trail conditions, if there are any fire restrictions or if you require any permits. Lake Arrowhead is only 25 minutes away from great snow skiing and cross country Skiing. Snow Valley Ski Resort, Bear Mountain and Snow Summit offer an impressive and convenient choice for Snow lovers visiting the Arrowhead Area. You will find a number of wonderful places to eat and sleep while your in Lake Arrowhead. Lake Arrowhead Village for shopping, dining, boating, Water Skiing, The Arrowhead Queen Boat Tour, entertainment at the Center Stage, special events like the wooden boat show, home expo, market night and festivals throughout the year. 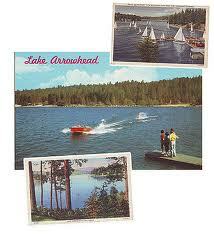 I like to educate my clients about Lake Arrowhead’s four corners of our exclusive “Crown Jewel”. The South East corner which consist of the exclusive gated community of Cedar Ridge where lots are 1+ acres and the Palisades consisting of Lake Front homes and a more neighborhood feel. The number one Bed & Breakfast in Lake Arrowhead with the most history dating back to the early 1900’s. Come stay in Lake Arrowhead’s most luxurious Hotel in a Lake Front room and enjoy the beauty of the lake. Fine dining at Lake Arrowhead Resorts Bin 189. Lake Gregory and it’s famous water slide, Horse Back Riding, Ice Skating, Golfing, Paragliding, Fireworks, Bowling, Beach Fun, Movies & Spa Services. Browse through the available websites related to Lake Arrowhead.